Just hours after we broke the news that Facebook had acquired FriendFeed comes Facebook’s announcement that it’s deploying its improved search product to everyone. This improved search functionality, which has been in testing since June, gives users the ability to search through shared media and status updates from their friends and the Pages they follow. And, perhaps more importantly, it lets users search through updates shared to ‘everyone’. The gloves are off — Facebook is going after Twitter where it hurts. 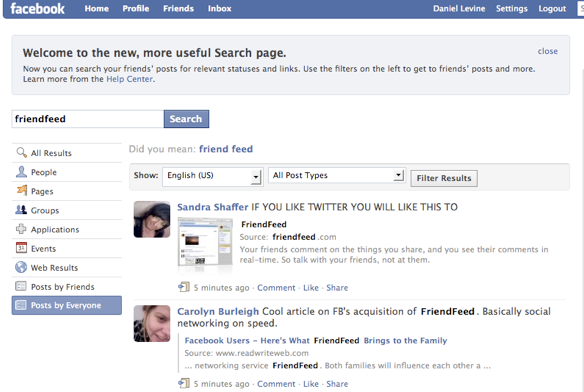 The new search will be a breath of fresh air to anyone who has previously tried to search Facebook for, well, anything. Under the old system, users had to browse through clunky categories to find their results, and there wasn’t a way to search though status updates or shared items at all. Now you’ll be able to simply click through different tabs on the left side of the page to jump between different categories, much as your would jump between Friends List on the Facebook News Feed. Another change is the way Facebook lets users ‘Search The Web’ — now these results are shown as a filter, rather than on their own page. And Facebook has also changed the search engine from Live.com to Bing, Microsoft’s rebranded and improved search engine. These changes are especially important because search has long been one area where Facebook fell well behind Twitter. Twitter Search has become an amazing tool for finding the most up-to-date information on a variety of topics, including everything from breaking news to movie reviews. Facebook has slowly been making headway in this area by allowing users to share status updates with ‘everyone‘ (before that only your friends could see status updates). But until now there hasn’t been an easy way to actually search through those public updates, which made the feature useless to most people. Now you’ll be able to jump over to Facebook search, click ”Posts By Everyone” and use it in much the same way you would use Twitter Search. You’ll see a list of matching updates from other users on Facebook, and a message at the top of the screen will update in real-time, alerting you as new updates containing your query come in. For the time being it looks like Facebook isn’t promoting the feature too heavily — the ‘Posts By Everyone’ is the last item in the list of search filters, and I suspect that Facebook has relatively few users who are sharing their updates with the public in the first place. That will likely change soon though, as Facebook is planning to roll out a new suite of privacy options that will suggest that users begin sharing some of their data publicly. Facebook’s 250+ million active users still dwarfs Twitter’s userbase, so even if only a small fraction of them begin using these new features, it won’t be hard for Facebook to become a serious contender in the real-time search race.